Do you want to find out how to use a DSLR as a webcam? DSLR cameras produce high video quality and they can be perfect for live streams, Skype conversations, etc. You don’t have to be a computer expert to realize that most of the webcams installed in today’s laptops or bought from IT stores produce low-quality video content. Some of them are marketed as producing 720p HD video, but even that is pretty outdated, considering the fact that most people love Full HD or even 4K videos these days. Even if you spend a couple thousand dollars on a powerful, insanely fast gaming laptop, it might still be equipped with a trash camera which doesn’t capture good video or audio content. What is to be done? Well, instead of spending a couple hundred dollars on a separate webcam which can be attached to the screen of your laptop or desktop, why don’t you use your DSLR camera? You just have to find out how to set up your camera and that’s what you’ll learn from this guide. Keep reading to find out yet another utility for your expensive photography gear and how to make the most of it. 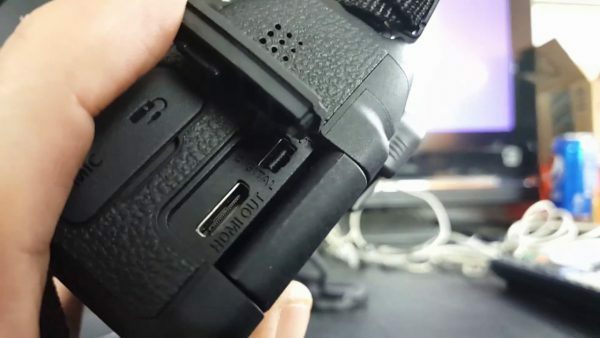 This method can be used on mostly all DSLR cameras that have an HDMI out port whether it’s a Canon, Nikon or Sony. If you are interested in getting the best video and audio quality, you need additional hardware in the form of a video capturing device. There are numerous ones on the market which come at different prices. For example, the Magewell USB 3.0 HDMI is an excellent one which allows you to get exquisite video and audio quality. You can also opt for the AJA U-Tap HDMI capture device which also provides great results. Why you need additional hardware? Because DSLR cameras, as well as GoPro cameras, haven’t been designed to act as webcams. The video capture devices will convert the video and audio signals from your camera into a format which is understood by your computer. You can save your videos as well as use different applications such as Skype or Twitch to create live streams. If you don’t want to invest in additional hardware, there is also a program which captures video from DSLR cameras, but the quality won’t be the same. I will talk about it later on. (Method #2). If you want the best video quality, you should go for the Magewell or Aja video capturing devices. These hardware tools are specially designed to capture video and audio footage from various devices (including DSLR cameras) and they are crafted to eliminate any type of delay. Therefore, if you stream your gaming sessions live on the internet, your viewership will enjoy a lag-free experience. Let’s talk about these 2 great video capture devices in greater detail. The Magewell USB 3.0 HDMI device has one HDMI input and one USB 3.0 port. It supports video input of 2048×2160 pixels and allows you to enjoy features such as cropping, color adjustments, aspect ratio conversions, mirror, and flip, etc. This device is compatible with most popular operating systems such as iOS, Windows, Linux and Chrome OS. You will be pleasantly surprised that the Magewell device is smaller than your smartphone, so it won’t occupy a lot of space on your desk and gives you the opportunity to enjoy state-of-the-art video and audio quality. 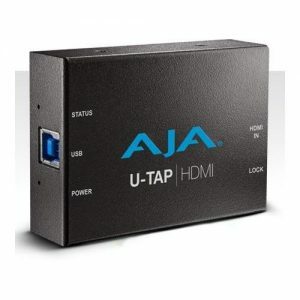 The Aja U-TAP HDMI device is also very small in dimensions and it features an HDMI port and a USB 3.0 port. It is compatible with Windows, iOS and Linux operating systems and it supports frame rates up to 1080p 60. This product comes with a warranty period of 3 years and doesn’t require you to install any third party software or drivers. 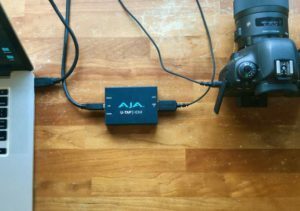 At the moment of this writing, your Aja U-TAP HDMI device costs a bit under $350 and it caters to all your video capturing needs. Keep in mind that you can use it for a wide variety of cameras and its small footprint makes it portable and easy to use at the same time. If you don’t feel like investing that much money yet, but still want a decent video quality, you can also go for the MYPIN video capture device which is priced around $90. This is an “in-between” option for those who would like to use their cameras as webcams without investing too much money at first. Now that you have the required tools, it’s time to do the connections properly and enjoy your camera as a webcam. You don’t need professional support to do this, just check out these steps and follow them accordingly. Connect your camera to the computer using a USB cable. This is necessary to continuously charge your DSLR. 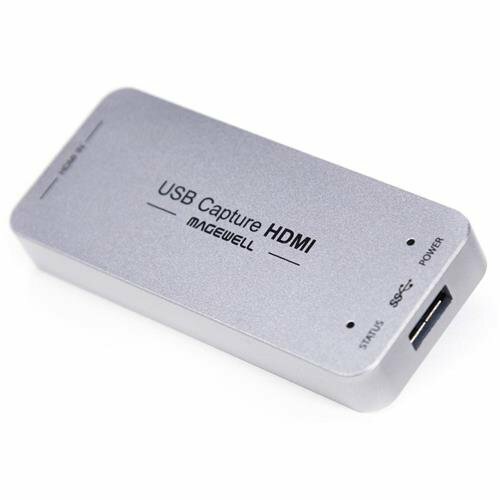 Connect the HDMI cable from your camera to the HDMI port of your video capturing device, whether you’re using Magewell, Aja or other hardware. Connect the USB cable of your video capture device to your computer. Make sure you use a USB 3.0 for faster data transfers. Download the OBS free software which allows you to adjust the video recording settings. You’re going to need it later for setting up live streaming as well. Power up your DSLR and in the Settings menu, choose either 1080p at 30fps or 60fps, depending on your preferences. Also, disable OSD (on screen display) to prevent the date and time to show up in your videos. After you have installed OBS software, go to Sources, Add and Video Capture Device. Choose the video capturing tool as your device and select Custom Resolution (1280×720 at 30fps) for the preferred resolution. In the Audio settings, also choose the video capturing device to record your audio while using your camera as a webcam. If you’d like to use your DSLR with Skype, go into Skype, Tools, Options, Video Settings and select your video capturing device for both the Video and Audio settings. This allows you to use your DSLR as a webcam while you chat with friends on Skype. If you’re interested in making live streams, use the OBS software. Go to Settings, Broadcast Settings and choose “live streaming”. If you’d like to simply record video footage and save it in your computer, you can choose “file output only” from the same section. These are the steps required to transform your camera into a high-quality webcam for streaming and video calls with friends. You might want to invest in a tripod or some sort of tool to hold your camera in place while filming and these can be found widely online at affordable prices. Additionally, you might also want to use an external microphone for recording audio. To do that, you’ll have to select “Microphone” in the Audio settings for both OBS and Skype programs. It is possible to use more than one DSLR camera as a webcam and for that, you need an additional HDMI switch which has 2 or more HDMI inputs. You might want to use more than one cameras as a webcam if you want to show different angles while recording video footage. To set up your cameras, plug them into the HDMI inputs of the HDMI switch and plug the HDMI output into the video capturing card. It is important to note here that you can only see one video feed at a time and you can toggle between them using the HDMI switch. If you are using this setup with Skype, you might encounter mirroring, but there’s nothing to worry about as this won’t be visible to the person you’re chatting with. 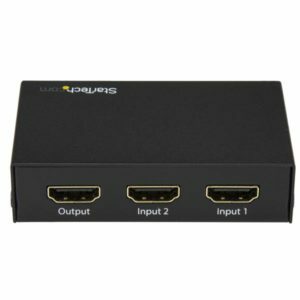 If you’d love to give this a try, all that you need to buy is an HDMI switch, a micro HDMI to HDMI cable and one HDMI cable for plugging the switch device to the video capturing card. Some of you might not want to invest in additional hardware at all and this doesn’t mean that you won’t be able to transform your DSLR camera into a webcam. The SparkoCam software allows you to do just that, but bear in mind that there are some limitations in comparison with using a high-quality video capturing device. SparkoCam is a free software which can be downloaded and installed computers which run the Windows operating system. It comes with premium features that can be purchased at prices between $40 and $180. It is ideal for Nikon and Canon DLSR cameras and it offers decent quality results. First of all, you start by connecting your DSLR camera to the computer using a USB cable. Turn the camera on and open the SparkoCam software window. In the Device tab, you should select your own DSLR camera from the list (Canon or Nikon). If you want to use your camera for Skype, go to Skype Options and choose SparkoCam Virtual Camera from the list. 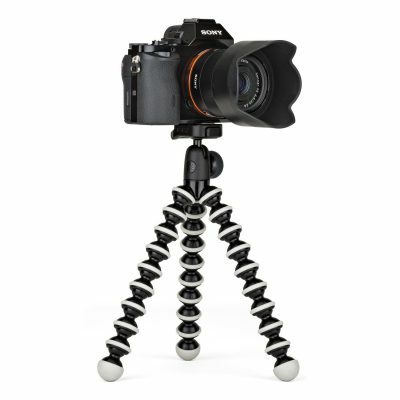 This automatically allows you to use your DSLR as a webcam, without requiring any other action. You can use your camera for other applications as well, as long as you can select the webcam source from the Settings menu. Support available – if you need help or you encountered a bug, you are just one email away from professional support from the program manufacturer. Adds watermark to the videos – if you are using the free version, every single one of your videos will have a watermark. This can be annoying for some people, but the watermark will be removed if you opt for a paid version. No audio recording for Canon and Nikon cameras – these DSLR cameras can’t use their internal microphone for webcam streaming, so you basically need an external microphone if you want to make video calls over Skype. This can be an annoyance for some, but an external mic isn’t that expensive these days and can provide excellent audio quality. Although using SparkoCam software limits your video and audio experience, it’s still a great tool to try if you want to use your DSLR camera as a webcam. This program allows you to select from multiple video recording options, adjusting settings and even adding effects to your clips. If you are happy with it, you can go for the paid version which adds more features and removes the watermarks. I have done a similar setup with my GoPro, you can check it here. Especially if you have a DSLR somewhere in your camera bag, hopefully, this short article gave you an idea on how you can make the most of it and enhance your video streaming experiences. It is a pity that most laptop manufacturers don’t add a decent webcam to their devices, but now we found a method to go around this small inconvenience without spending a fortune on a brand new webcam. Keep in mind that the more powerful your video capture device is, the better video and audio quality you enjoy. If you’re a professional YouTuber, gamer or you make regular video calls on Skype to chat with your friends or business partners, using your DSLR camera as a webcam might be one of the smartest moves you can make!